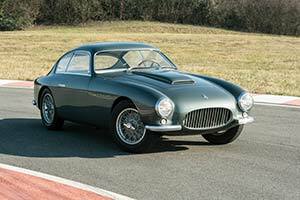 As a rolling chassis, this 8V was dispatched from Turin to Zagato's Milanese shop in May of 1954. Here it was fitted with a coupe body bodywork that was finished in emerald green. Its first owner, who was based in Turin, registered the car for the road in August of 1955. This 8V Zagato was never raced in period but later in its life, subsequent owners did use the car in historic events. By the mid 1980s, it joined the stable of Gianfranco Pittarel, who fielded the car eight times in the MIlle Miglia Storico during his 30-year ownership. Finally sold on in 2013, the next owner, who was again an Italian, had the 000076 comprehensively restored and painted in its original emerald green colour. Still fresh from its restoration, the lovely Fiat was consigned to the 2019 RM Sotheby's Villa Erba sale.